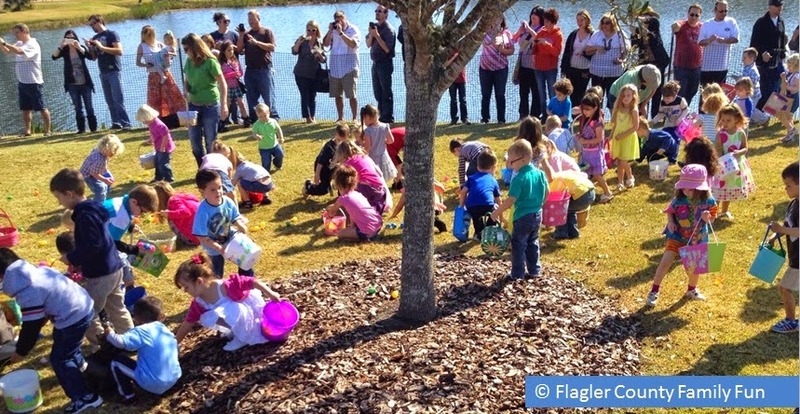 Families will have the opportunity to celebrate the Easter holiday with two fun and free activities – one geared toward children and one for teenagers – offered by the City of Palm Coast’s Parks & Recreation Department. 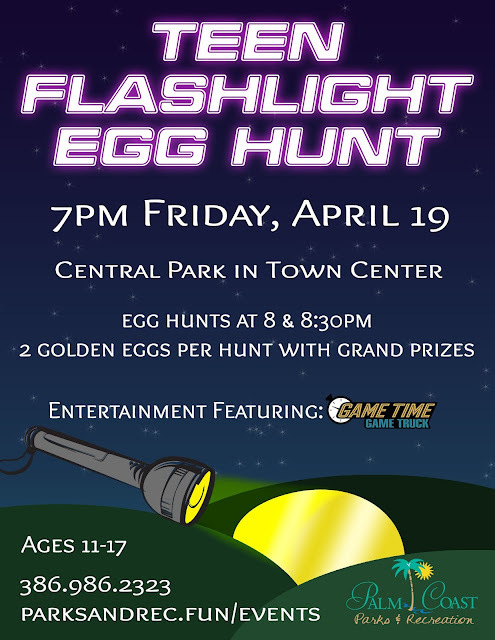 CANCELLED DUE TO WEATHER - For youth ages 11-17, there will be a special, after-dark Teen Flashlight Egg Hunt on Friday, April 19 from 7-9 p.m. at Central Park. More than 2,000 glow-in-the-dark eggs filled with candy will be up for grabs. Two separate egg hunts will take place - one at 8 p.m. and the other at 8:30 p.m. - and will include two golden eggs per hunt with grand prizes. A local food truck will serve dessert and the Game Time Game Truck will also be there. 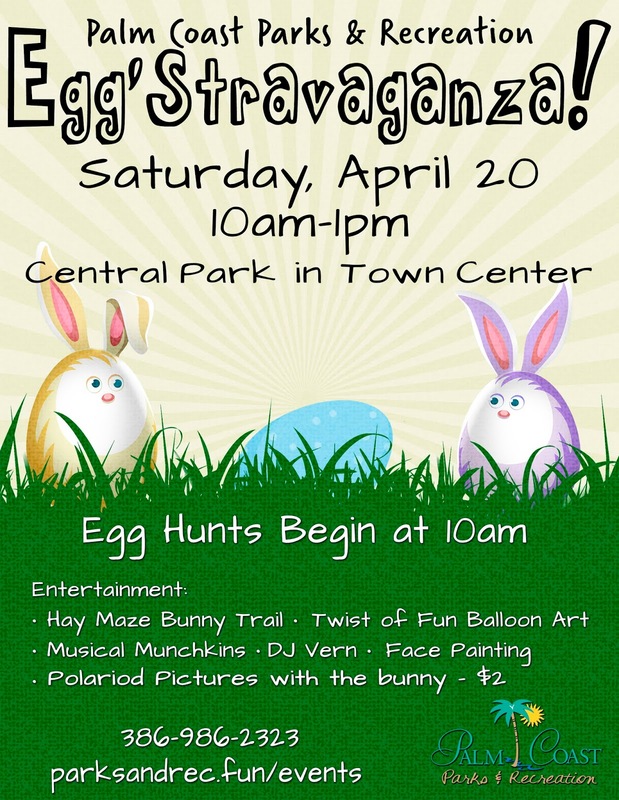 The Eggstravaganza egg hunt is set for Saturday, April 20, at Central Park in Town Center, 975 Central Ave., Palm Coast. Activities will include egg hunts for 10,000+ eggs, so don't forget your Easter basket! More than 10,000 candy or toy-filled eggs will be scattered in a dedicated egg patch at the park. In addition to the Easter egg hunts for children up to 11 years old, there will also be other exciting activities such as balloon art, carnival games, hay maze bunny trail, face painting, refreshments and pictures with the Easter Bunny. The Easter Bunny will arrive around 10:15 a.m. and will be available until 12:30 p.m. inside City Hall. Families can take their own pictures for free or pay $2 for a Polaroid picture. Also at the event will be Sheldon (the Daytona Tortugas mascot) and the Chick-fil-A cow in character stations at the event. The free hunt is one of the City’s most popular events drawing more than 4,000 people out for the spring tradition each year. Admission to both events is free. For more information, call Parks & Recreation at 386-986-2323.